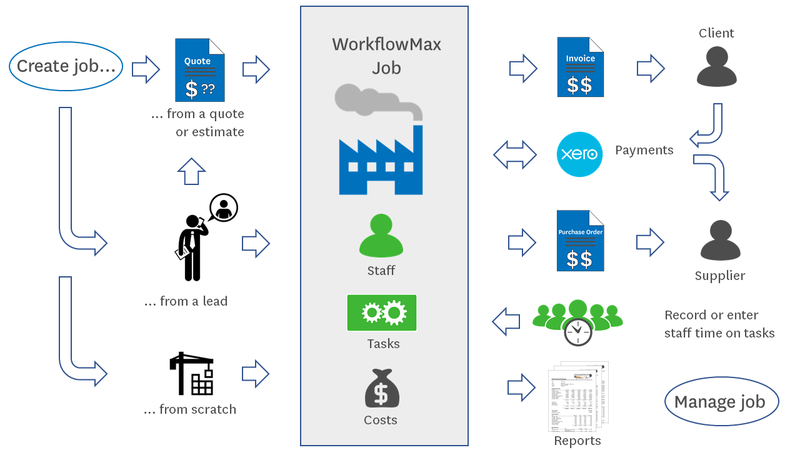 Before you read about the stages in the flow of a typical WorkflowMax jobA job is the overall project that you or your organisation works on for a client., you might find it useful to watch the following video, which gives an overview of how the software supports a typical job flow. The WorkflowMax job flow typically consists of the stages shown in the diagram below. Open the drop-downs below to learn more about the features and options at each stage of a job. a leadA lead is a possible sale opportunity for a prospective client (a prospect) or an existing client. in the optional Lead Manager module to start tracking and managing a new prospectProspective clients (prospects) are clients who you haven't actively done work for yet. Prospects are created directly from the Client manager + New button; if you add a new prospect to a new lead; or if you import leads and the clients don't already exist. or client. When the lead is 'won' you can easily convert it into a job. Alternatively, you can create a quote or estimate from the lead. a quoteA quote contains details of the costs that your client should expect to incur if they proceed with the job. There may be some variation between the quoted costs and actual costs, but your client should have some confidence that this variation will be small. In WorkflowMax there is no difference between an estimate and a quote, apart from the name. In practice, the client may expect that quoted costs will be more accurate than estimated costs, if the job goes ahead. See also Master quote. or estimateAn estimate contains details of your best estimate of time or costs for completing a job. Your client should understand that an estimate is not a firm quotation for the exact number of hours or cost. In WorkflowMax there is no difference between an estimate and a quote, apart from the name. In practice, the client may expect that quoted costs will be more accurate than estimated costs, if the job goes ahead. See also Quote and Master quote. in the Quote Manager. When the quote/estimate is accepted, you can easily convert it into a job. You can create a job directly, with (or without) the preceding lead or quote/estimate stage. The job may contain tasks and possibly costs from the quote/estimate, but you can add more tasks and costs as you set up the job, if required. For costs that may be applicable to several jobs, you can store them in the Cost Admin databaseIn WorkflowMax, the costs of the products, materials or recurring expenses that you typically use while working on a job can be stored in the Cost Admin database (at Business > Settings > Costs). When you are working on an estimate, quote or job you can quickly access a cost from the database, simply by typing its name in the description field (on the cost information screen)..
Once the job costs and tasks are set up, you can schedule the job, allocate staffStaff are members of your organisation who perform work for your clients. Staff are usually set up as users in WorkflowMax so that they can login to enter time sheets, produce reports or invoices or perform other job-related activities. to it, change the job stateJob states usually match the stages in your company's job workflow, such as Planned, In Progress or Completed. By adding notifications to each job state, you can communicate to key people how a job is progressing - and when it's time for them to take action., add some milestonesA milestone is a scheduled event that marks the completion of a significant deliverable element or component of a job. For example: send first draft to client; building inspector signoff. and monitor costs and progress. Jobs can even contain to-do itemsTo-do items are checklist items within a job task. They provide useful reminders of specific action items within the task, such as "confirm delivery" or "contact client". Staff can tick off completed to-do items as they work their way through the task. within each task that can act as reminders to complete specific activities as work progresses. The following stages can occur in any order during the life of the job - repeating or overlapping, as required. The final, reporting, stage can be used to track job progress and profitability as soon as there is valid time, cost or other data to report on. As work progresses on the job you can use Quick time entryThe WorkflowMax quick time entry pop-up provides a timer that lets you record time as you work it. You can also enter time directly against job tasks. or TimesheetsIn WorkflowMax, time sheets contain details of the time worked on specific tasks by each staff member during a given week. to record or enter your own time worked. With suitable privileges in place, you can also enter time for other staff members. If required, you can use the Purchase Order ManagerThe Purchase Order Manager screen allows you to quickly sort, browse and find all current purchase orders. to create purchase orders for materials and other items you need to perform the job. You can also receipt the purchase orders as the goods (and the corresponding supplier invoices) are delivered. To ensure a healthy cash flow, you can use the Invoice ManagerThe Invoice Manager screen allows you to quickly sort, browse and find all current invoices. You can also create invoices in the Job Manager, WIP Manager and Client Manager screens. to create progress invoicesA Progress invoice should be used for on-going jobs, or jobs where there is a likelihood of further time or costs being added to the job. throughout the life of the job. And, when the job is complete, you can create a final invoiceThe last invoice produced for a completed job. to close off the job. For additional options, you can also create invoices in the Job Manager (Financial tab) or produce invoices for multiple jobs or clients at the same time by using the WIPWork In Progress in WorkflowMax is all uninvoiced staff time and disbursements recorded on client jobs. Manager or Client Manager. At any stage of a job in WorkflowMax you can report on income and expenses, track staffing levels and schedules by using the comprehensive set of standard reports. You can also use Report BuilderThe report builder lets you create custom reports on the data stored in WorkflowMax. Report builder can create table reports (standard column and row report format), bar charts and pie charts. to create your own custom reports.